So, who the hell founded this distillery? My keen and occasionally flagging interest in whisky history has drawn me down a dark road which seemingly has no end. According to the distillery itself, which one would expect to have the final say-so in this kind of thing, Glen Garioch was founded by brothers John and Alexander Manson in 1797. Hence the 1797 date in the title of the whisky under review here. I hesitate to assume the role of grammar cop for obvious reasons, but if the distillery was founded by two brothers, wouldn’t it be Founders’ Reserve, not Founder‘s Reserve? That seems like one of those fairly obvious typos someone would catch early on, but you know…interns just aren’t what they used to be. So I was happy to accept the distillery’s history until I took a quick gander at the always reliable Malt Whisky Yearbook’s Glen Garioch section. According to this yearly font of whisky knowledge, the distillery in question was founded in 1797 by a man named Thomas Simpson. Then, 40 years later, it was reportedly sold to a John Manson. If this was the case, it would clear up the whole singular vs. plural possessives thing, but creates a bit of a mystery as to why the distillery leaves out this poor Tom Simpson character all together. Now I’m confused and slightly more curious than I was when I started. Digging a little deeper, I found that no less of a source than Alfred Barnard’s seminal book, The Whisky Distilleries of the United Kingdom, states that Glen Garioch was founded in 1797 by a firm named Ingram, Lamb & Co. who owned it until 1840 when they sold it to a John Manson & Co. Well, at least the year 1797 and the name John Manson keep showing up, perhaps we’re closing in on the getting the story straight after all. Or not. Turning to another beloved author’s text, Michael Jackson’s Complete Guide to Single Malt Scotch, in the Glen Garioch section, there’s reference to a local newspaper announcing in 1785, the licensing of a new distillery in the same location as the current distillery. There are no names bandied about, but it’s safe to say that 1785 was no 1797. We could keep going (I did). Variations put forth by other respected websites and books mention that the distillery was founded either in the year 1797 or in 1798. The Manson Brothers show up often enough, but so does this shadowy Thomas Simpson character. In some instances the name Mason shows up instead of Manson, throwing yet another monkey wrench into the works. So back to my original question…who the hell founded this place? I’m not sure I’ve ever looked at a distillery with more ambiguity as to its origins. If there’s precious little documentation from the time, I suppose there are many possible explanations. It seems there were many distilleries in close proximity, so perhaps who founded what, where, and when has gotten a bit muddied over time. I suppose it doesn’t really matter. While I enjoy dissecting possibly shaky marketing, I can’t really blame a company for going with the best-sounding, most-likely backstory. No one ever came to a marketing meeting saying, “we’ve got a confusing and undocumented past, that kind of thing really sells bottles, let’s emphasize that!” Perhaps some historical facts (and possibly a little grammar) have been glossed over, or perhaps not. Perhaps someone with more authority and/or research acumen will weigh in and clear all this up. Now then, on to the whisky! 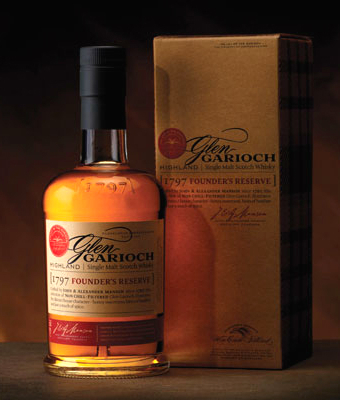 Glen Garioch (pronounced “Glen Geery”…we’ll save that one for another time), debuted the 1797 Founder’s Reserve back in 2009, when it handsomely revamped its entire line. This entry-level expression was matured in a combination of ex-bourbon and ex-sherry casks, most likely all American Oak. In an admirable move, Glen Garioch has bottled this one un-filtered and at a significantly higher ABV than you see most whiskies in its price range…those decisions alone deserve some applause no matter who founded the place. The Nose: Fairly zippy with a sweet ‘n’ savory complexity to it. Dark amber honey and that old Buc Wheats cereal (god, I loved that stuff), along with a bit of lemon-lime soda. Nice soft touches of salty Manzanilla sherry as well. Softly beery hints of a Baltic Porter lead to very subtle savory notes of browned meat in oiled cast iron. There’s fine white pepper and polished oak as well, along with a little of the solvent-y furniture polish that polished it. The Palate: A very soft, almost airy mouthfeel with a peppery initial honey and citrus sweetness. More slightly salty Manzanilla sherry notes, now accompanied by some very dark chocolate. A bit of that savory character from the nose emerges towards the end with increased sharp, oak-y spice – toasted oak chips, peppercorns, and ginger. The youth of this one really shows up towards the end. Thoughts: I have to say this really grew on me. I was not overly impressed initially, the young sharpness was overwhelming its interesting complexity. But coming back to it, that rugged flavor profile stood out more. While I like the sweet and slightly savory of the nose, and the sherry-esque notes throughout, I just wish some of those jagged, young edges were smoothed out. The high ABV (at least for an “entry-level” expression) is a very welcome sight and suits this nicely. It’s quite drinkable neat, water does smooth it out some, but many of the youthful notes remain. At around $40-$45, this is a fair value for a higher ABV, slightly more challenging entry-level malt. There’s lots of potential here, I’d love to see what the addition of some older whiskies would do to it.